After a very busy day at camp the day before, the Scouts enjoyed some free time in the afternoon on Thursday. We all awoke at 6:30 a.m. to get ready for the flag raising and breakfast. We enjoyed waffles, sausage, cereal, milk, and juice to get us going for the day. Several boys got seconds today. The meal started with the troop singing "Happy Birthday" to Mr. Stanford. It was his 39th birthday. After breakfast, everyone headed in their familiar directions to merit badge classes or Mountain Man. Less things were forgotten today, so it seems the Scouts are learning to bring the important gear with them. After the classes, we met back up for lunch where we enjoyed chicken sandwiches. Very unlike our favorite Chick-Fil-A sandwiches, they were just okay. They were accompanied by french fries, corn, and ice cream. Several items including some care packages arrived at camp the day before, but while we were out rafting. Those items were delivered to the Scouts today. Then when the mail came in today, many more letters appeared for the Scouts. These letters brought about mixed emotions ranging from sadness because they miss home to happiness because they got something from a loved one. After lunch, the troop went in several different directions during free time. Clayton and Jason went fishing and Clayton was successful in catching a few brim. Jason was close many times — including when he almost caught a snapping turtle. Mr. Pendleton took Ethan, Joe, and Mark to the Davis Inn, which is a homestead from the 1920s where there was tomahawk throwing, sling shots, chickens, a garden, a blacksmith that brands leather, and more. This is a neat area and also a really nice hike to get there. It's a beautiful part of the Appalachian mountains. Mr. Stanford rappelling on his birthday! Several other Scouts had to take care of some items for merit badges during this afternoon free time. 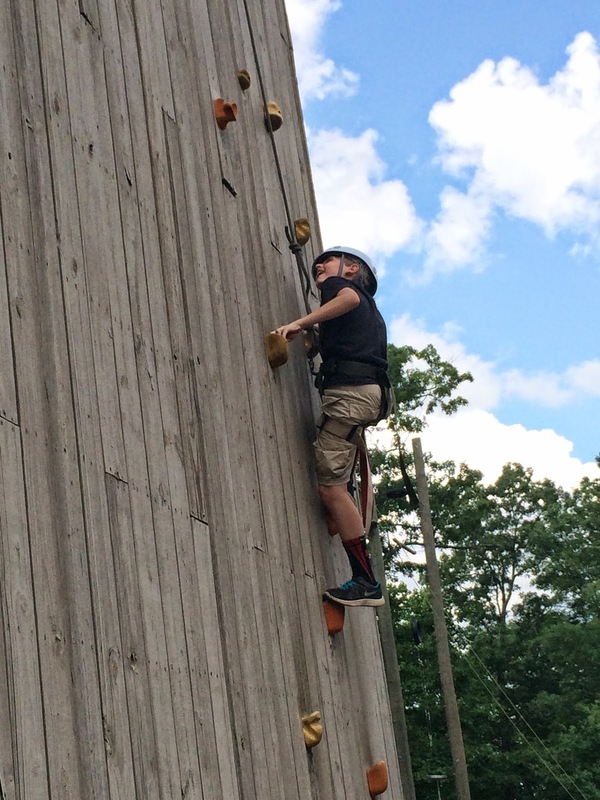 Mr. Stanford led a group to go climbing and rappelling. 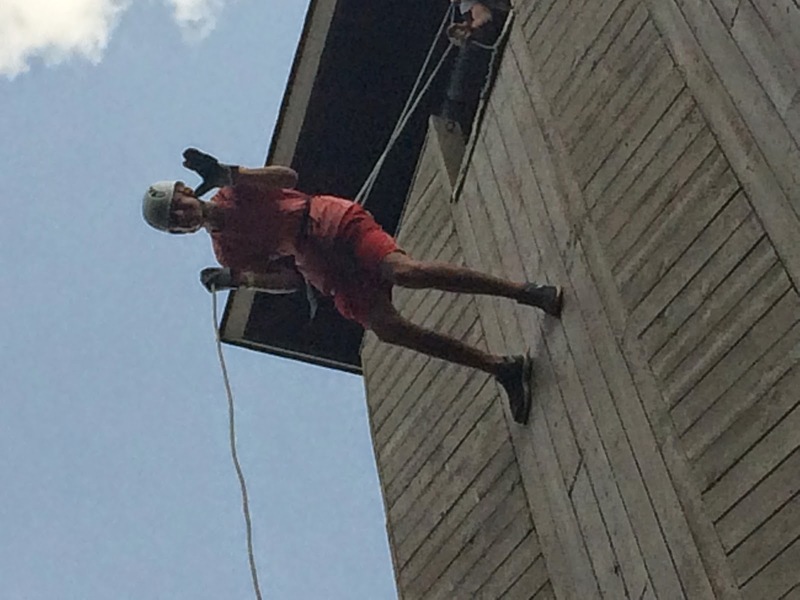 Mr. Stanford along with Andrew, John, Robert, and Will had rappelled before and enjoyed getting back on the tower. 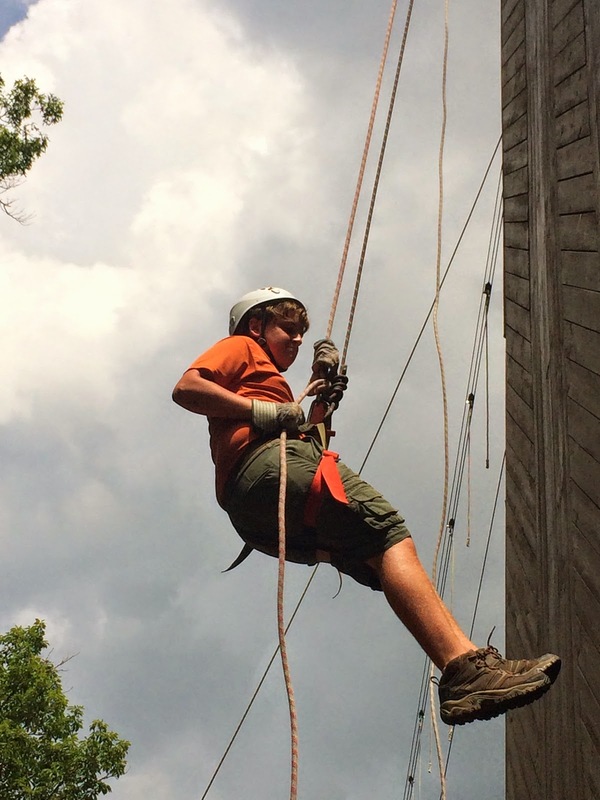 It's exciting that we now have three more Scouts who can add rappelling to their resume. 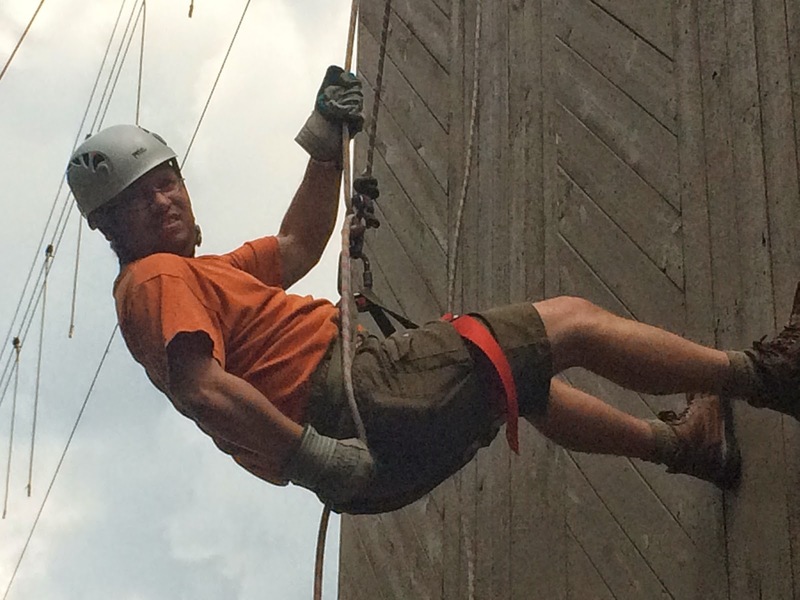 Creighton, Michael, and Rusty nervously attached themselves to the rope and leaned out over the 65-foot tower. They enjoyed it enough that they each went about two or three more times, if not more! Andy, Aidan, Liam and others also tried out the rock climbing wall, the chimney climb, and some bouldering. 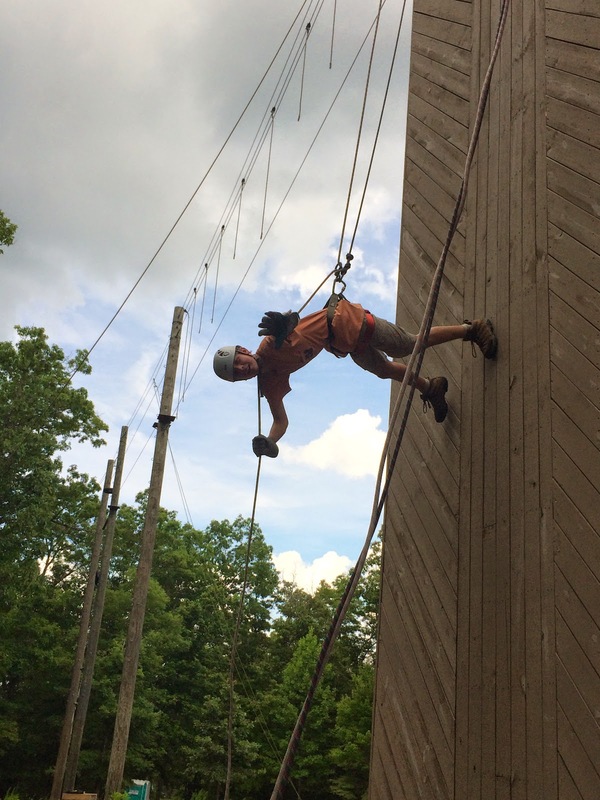 It was nice to see the Scouts challenging themselves to try new things. Speaking of trying new things — Andrew and John decided it would be fun to rappel "Australian style", which is face first. Things like this activity is why moms don't come to Boy Scout camp! After all of this excitement, we all relaxed a bit before heading to the flag lowering and dinner. Scouts ate dinner on their own while Mr. Pendleton and Mr. Stanford went to the Scoutmasters' dinner. The leaders enjoyed a grilled steak, baked potato, salad and roll. And for dessert, there was cheesecake and a few speakers. 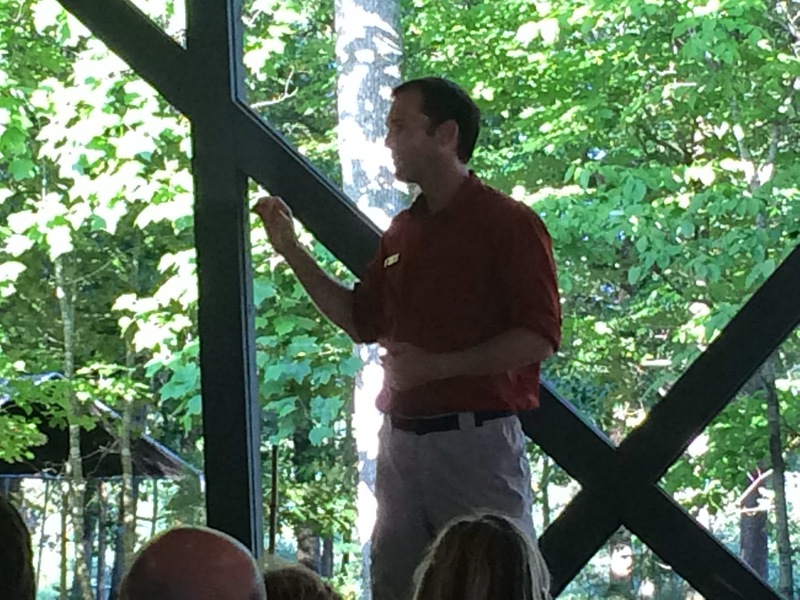 The main speaker was Alvin Townley, an acclaimed author and Eagle Scout from Atlanta. He shared some of his Scouting experiences and how he sees the importance of Scouting in society. He also promoted his new book. He also gave out a few books and Mr. Stanford was lucky enough to win Legacy of Honor on his birthday. He won it by virtue of earning his rank of Eagle closest to his 18th birthday of any other leaders present. After dinner, the troop broke up into three main groups. The troop had signed up to go mountain biking, so most of the troop went and did that activity and had a great time! Except for a few equipment issues and some erratic riding, everyone seemed to enjoy themselves. Another group of Scouts went on a scavenger hunt around camp to help the troop earn an Honor Troop Award. Andy, Liam, Jason, and Mark helped our troop secure enough scavenger hunt items to qualify for that portion of the award! The final group of Scouts stuck around the dining hall after dinner to help clean up. This has been a common occurrence for several Scouts after meals throughout the week and this time they stayed until after 9:30 p.m.! This is great service by our boys and it's nice to see them giving back to the camp when there is a need. Before bedtime, we invited the other troop in our campsite (Troop 46 of Turin, Georgia) to join us for a cracker barrel (food, drink, and social time). Some Scouts weren't too interested in meeting others, but there was enough interaction to make this a fun time. Besides, who doesn't enjoy some snacks and drinks? Scouts got a shower and headed to bed with only one more full day ahead of them! It was a fun day with lots of happenings. I'm sure Friday will have lots of tales to tell. For more Day Five pictures, be sure to visit our online photo album.